No modern gentlemens wardrobe is complete without a go-to sweatshirt and with its on trend embroidered styling this iconic long sleeve sweat from Crew Clothing is the perfect pick. We are sure it will soon become a key part of your casual attire. This Sennen Crew Sweatshirt is all about both comfort and style and being crafted from 100% cotton its certainly one of our favourites. 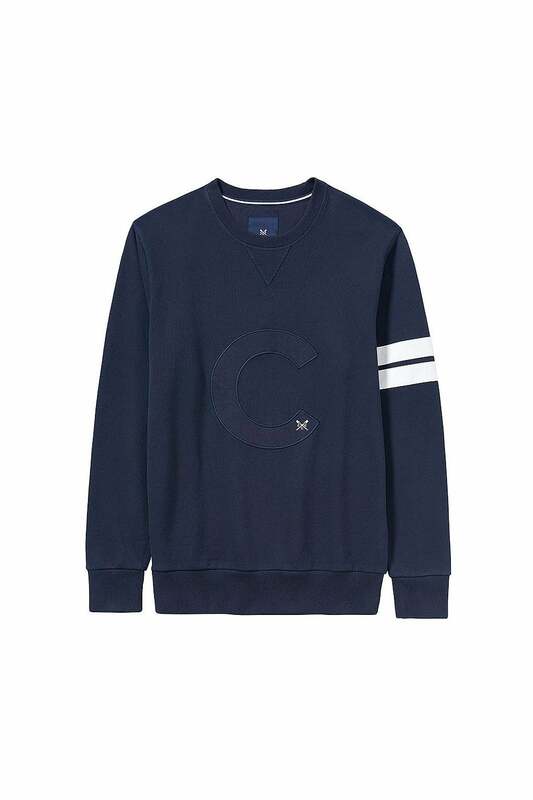 A varsity style sweat with an oversized appliquÃ©d â€˜Câ€™ and stylish stripes on one arm this sweatshirt will seamlessly mix and match with your pre-existing wears and is a perfect additional layer. Further details include ribbed cuffs hem and neckline whilst the whole look is finished with Crews signature crossed oars embroidered on the C.
A supersoft sweat that goes perfectly with your favourite jeans - an ultimate must-have.